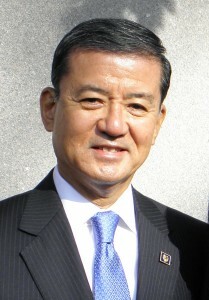 WASHINGTON — Secretary of Veterans Affairs Eric K. Shinseki issued the following statement to commemorate Veterans Day 2012. Three days ago, the citizens of this great land decided who would have the privilege of leading our nation for the next four years. It is a time-honored process reflecting both the wisdom and the power of the American people. Today, America honors the men and women whose profound acts of citizenship — service in the armed forces of the United States of America — have safeguarded our country for 237 years and guaranteed our rights as Americans to choose our leaders. For the past 11 years, the men and women of our armed forces have stood watch in Iraq, in Afghanistan, Europe, Korea, and more than 150 other countries around the globe. More than 1.5 million veterans have served in the combat theaters of Iraq, Afghanistan, and the Horn of Africa. Since 9/11, nearly 3 million veterans have departed the military, having fulfilled their duty to the Nation, and become eligible for the benefits and services we offer here at the Department of Veterans Affairs (VA). We are often reminded that, today, less than 1 percent of Americans wear the uniforms of our nation. The sum of their service to the country, however, is beyond measure. Our rights and privileges as American citizens have been their gifts to each of us. We must not take those gifts for granted. On behalf of the American people, each of us here at VA has the responsibility of caring for these giants among us. Integrity, Commitment, Advocacy, Respect, Excellence — I CARE — are our watchwords. VA is renewing our country’s historic covenant with its veterans. By leveraging 21st century technology and empowered by a dedicated workforce, over one-third of whom are veterans themselves, VA is boldly transforming itself in healthcare and benefits delivery, and in memorial affairs, to better serve all veterans. Our goals remain unchanged: increase access to VA benefits and services; eliminate the backlog in compensation claims in 2015; and end veterans’ homelessness, as well, in 2015. In this department, every day is Veterans Day. We celebrate their contributions, take pride in their achievements, and as their national advocates, care, nurture, and protect them as well as they protected all of us. I extend my thanks and admiration to our nation’s veterans on this, their special day of recognition, and I express my deep appreciation to my colleagues at VA for their dedication, their loyalty, and their partnership in this noble mission.